For starters, we were served Chili Cheese Fries (Php 155). It is homemade fries topped with red beans, ground meat, chili, and melted cheese. This is the kind of fries any fries addict would love. Never mind the chili, it wasn't too spicy for me. We also had these pasta: Chicken Alfredo (Php 195) and Shrimp Diablo (Php 275). Their pasta dishes are good for 2 -3 persons. The Chicken Alfredo is super creamy topped with seasoned chicken fillet and fresh basil. If you want something spicy, the Shrimp Diablo is for you. It's fresh shrimp sauteed in a special spicy tomato cream sauce. I love both pasta dishes, the creaminess of the Chicken Alfredo is just right and the Shrimp Diablo really flavorful. We also got to try Red Buffalo's signature wings. Their yummy wings are available at different packages: Single (5 pcs, Php 165), Double (10 pcs, Php 320), Family (20 pcs, Php 620) and Party (40 pcs, Php 1190). Don't worry about the mess, since they have disposable gloves at each table. There are different levels of hotness of the Original Buffalo: Hot, X-Hot and Suicidal. I think we were served the Hot, because I could still tolerate it. But I wouldn't eat anything hotter than that. I couldn't play favorites between Parmesan Garlic and Teriyaki. I really love both flavors. I think everyone in our group did. :) Both flavors are really delicious! You may also add Bleu Cheese or Ranch dip for the wings. Other flavors for the wings are Honey Bourbon, Sweet Heat BBQ and Hawaiian. We also tried their specials like the Double Cheesy Bacon Burger (Php 235, add Php 35 for homemade fries) and Hickory Baby Back Ribs (Php 375). The Double Cheesy Bacon Burger has two quarter-pound beef patty with cheddar cheese, bacon, mushroom. The burger was really huge! I found it really meaty. The Hickory Baby Back Ribs are half-slab baby back ribs on hickory-bourbon sauce, served with coleslaw and homemade fries. It was really tender that the meat easily falls off the bone when I tried carving it. I love it! We were also served the non-alcoholic beverages: House Blend Iced Tea (Php 55), Strawberry Lemonade (Php 70) and Kiwi Lemonade (Php 70). They also have floats and milkshakes. 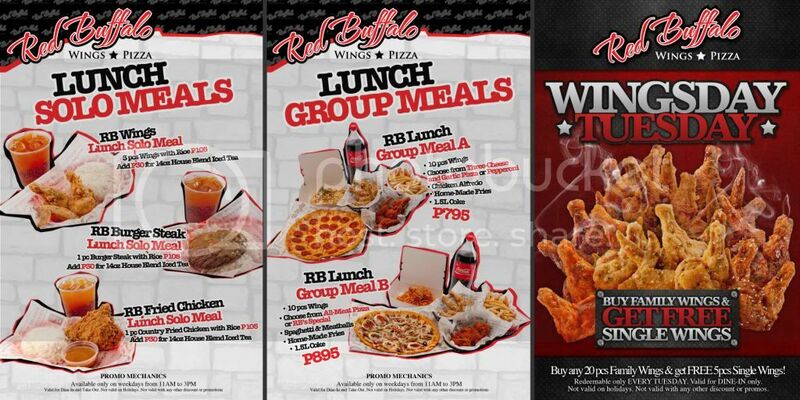 Red Buffalo Wings & Pizza has recently launched Wingsday Tuesday, wherein every Tuesday, you can get FREE Single Wings for every purchase of Family Wings. Also, starting this November 12, they'll be launching LUNCH SOLO and GROUP Meals. And on November 15, they'll be launching the RED BUFFALO FREQUENCY CARD as thank-you to their loyal customers. Overall, Red Buffalo Wings & Pizza is a place worth a trip whenever I'm craving for crispy wings, pizza, and even ribs! I'd love to get my hands on those wings again and try the other pizzas and the milkshake. Thumbs up to Red Buffalo! Thanks to Ms. Cheska Zamora of Red Buffalo for having us. This reminds me a little bit of TGIFridays, and it's also a bit pricey huh. I am particularly interested about the buffalo wings especially the parmesan garlic. Firstly- ayokong mag hanap sa google nang kung anung ibig sabihin ng dekaphobic, ikaw alam mo yan. lol. Kaya tell me.. hahaha..
yenewey- mabisita nga yang place na yan!